In 1994, upon the (more or less) 50th anniversary of his career, New York’s Whitney Museum held a retrospective of the work of the photographer Richard Avedon. This book, with essays by the show’s curator, Jane Livingston, and New Yorker essayist and art critic Adam Gopnik, was the exhibition’s companion piece. And now it’s our best access to that comprehensive overview of the photographer’s work. Born and raised in New York City where he was co-editor of his high school newspaper with James Baldwin (yes, that James Baldwin), Avedon attended Columbia University when Kerouac and Ginsberg did, dropped out and joined the Merchant Marine during World War II – and only then began taking pictures, launching him on the career that would make him the subject of retrospectives like the one at the Whitney. But why? Is it merely the longevity, the 50 years captured here that were perhaps the heart of the American century? Is it the celebrities? Is it the fashion? Is it the journalism? There’s a complexity to Avedon’s work that is persistent and many-layered and is as reflective of the times as it is soaked in it. For starters, there’s the subject matter. Avedon was as famous for his glamourous celebrity portraiture and haute-couture fashion work as he was for the essays he did on the insane, on the Civil Rights movement, on the American West, and on the victims of Vietnam. But there’s also a remarkable complexity of tone. There’s work that feels stunningly in the moment, cheek by jowl with images that are so clearly (and charmingly!) contrived. Look at the joyously – iconically – artificial covers for “Bazaar” that still leap off the page. And compare them to the baldly, nakedly revealing portraits – not the literally naked images of Warhol and his Factory crew or the Monty Python lads, but of, say, Truman Capote in the 50s, 60s and 70s. Or of the strangers holding up newspapers on 11/22/63. Or of Marilyn in ‘57 or of George Wallace at any time. These are images that capture that fraction of an instant in which the subjects reveal something that adds depth and meaning to all we know about them. And then there is the complexity of those very moments – because they were not accidental. Avedon planned these revelations, went into the sessions with very specific thoughts about who he was shooting and what story he wanted to tell. Which flew in the face of what critics thought photography should be – and of what people thought a fashion photographer should do. And that makes the photographs themselves more complicated yet again. And finally there is the complexity of his own celebrity. This is the man, after all, whom Fred Astaire portrayed in “Funny Face”. And what it means to be Richard Avedon shooting Judy Garland is thus fundamentally different from what it means to be Richard Avedon shooting James Kimberlin, a drifter on a New Mexico highway. And what’s fascinating is that these are all questions about the nature of late 20th century culture, are they not? Who is important and why and what does it mean and what do we think it means and what does it say about us? The ever flattening of foreground and background, of subject and viewer, of us and them, that Picasso and Braque began, that the Abstract Expressionists continued and which Warhol turned upside-down. What does it mean to be famous? Who is famous? Why? Where is the line drawn between the public and private person? What is style, fashion, art and what relation do they have to any of us? And who are we, anyway? Are we the sum parts of our culture? Is culture a reflection of us or of who we want to be? And aren’t the answers to these questions the tools we use to communicate to each other the truths about ourselves – or at least, the truths that we want others to know about ourselves. And while our using them to sell things to each other adds another layer of complexity to the work of Avedon, so does the fact that Avedon himself used them to sell – both for the products of his clients and for himself – to America and the world. Late in the book, Adam Gopnik cites W. H. Auden, the subject of at least two wonderful images by Avedon, as saying “Does God ever judge us by appearances? I suspect that he does.” Avedon certainly thought so, and, one walks away from this book feeling as dizzy from the statement as from the photographs themselves. 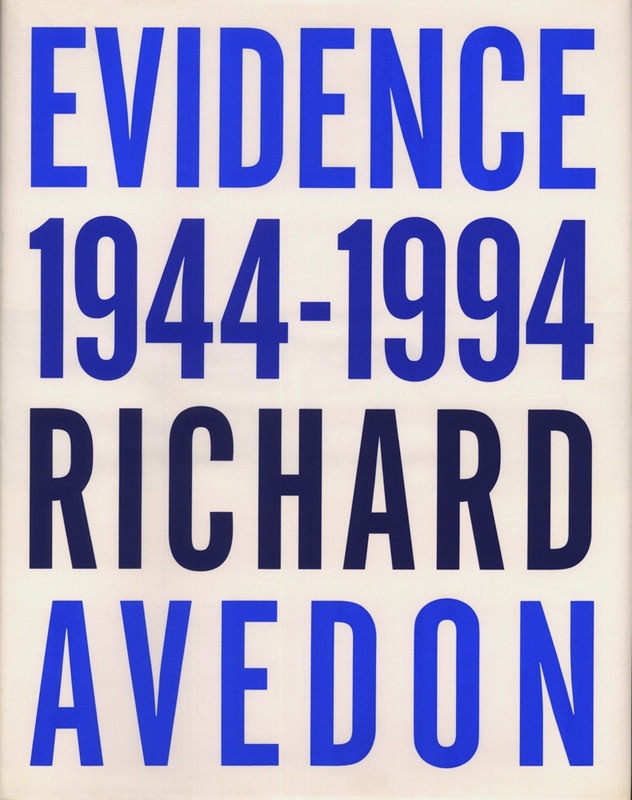 Evidence 1944-1994 with essays by Jane Livingston and Adam Gopnik was published by Random House on 05/10/94 – order it from Amazon here or from Barnes & Noble here – or pick it up at your local bookseller (find one here).